The Sweepstakes winner will receive a six (6) day / five (5) night vacation package to the Walt Disney World Resort for Sweepstakes winner and up to three (3) guests consisting of the following elements for the Group:  hotel accommodations consisting of one (1) standard room/quad occupancy, including room tax) for five (5) consecutive nights at a Disney Moderate Resort at the Walt Disney World Resort selected by Sponsor in its sole discretion; based on availability;  if Sweepstakes winner’s residence is located more than 250 miles from the Walt Disney World Resort, up to four (4) round-trip coach airfare transportation tickets for the Group on a Sponsor-selected carrier between a Sponsor-selected major metropolitan airport near Sweepstakes winner’s residence and Orlando International Airport; but if Sweepstakes winner’s residence is located 250 miles or less from the Walt Disney World Resort, then air transportation or any other form of transportation will not be provided to the Group;  up to four (4) round trip ground transfers between the Orlando International Airport and the hotel via Disney’s Magical Express Motor Coach Service when air transportation is provided;  up to twenty-four (24) 1-Day Magic Your Way Tickets;  one (1) $750 Disney Gift Card for use while at the Walt Disney World Resort; and  a $2,000 check made payable to Sweepstakes winner. The ARV of the Sweepstakes Prize is $12,366. The One Magical Mission Instant Win Game and Sweepstakes is offered only to legal residents of the fifty (50) United States and the District of Columbia who are at least eighteen (18) years old. The One Magical Mission Instant Win Game and Sweepstakes ends on September 30 at 11:59:59 PM ET. 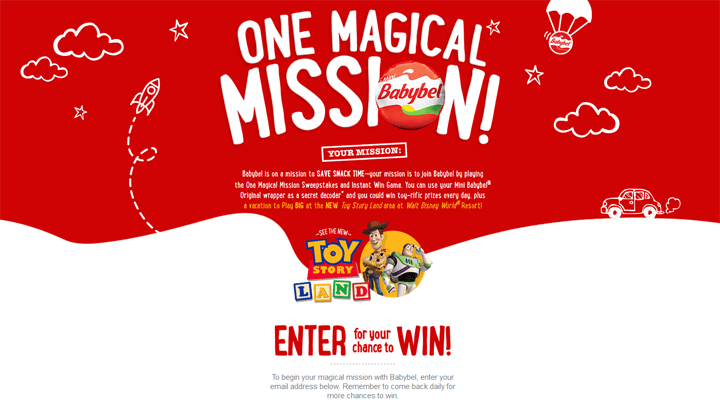 An eligible entrant must visit BabybelMagicalMission.com and submit his/her valid e-mail address.